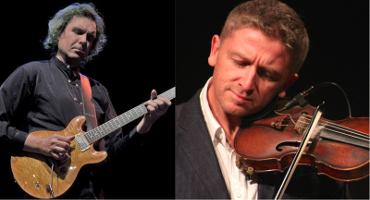 See the best jazz violinist in the country with one of the most stunningly versatile guitarists – sparks will fly and strings will be on fire with sublime music as they touch every genre – gypsy / jazz / modern / classical /rock . Christian has worked with Wynton Marsalis, Nigel Kennedy, Julian Joseph, Bireli Lagrene, Dolly Parton, All About Eve, Van Morrison, Cleo Lane, Brian Ferry , Caro Emerald, Sweet Chorus and is a professor of jazz and non-classical violin studies at the top three London music academies. John’s long and varied career includes playing with Stephane Grappelli, Soft Machine, Nigel Kennedy, John Williams, Birelli Lagrene, Andy Summers (ex Police), Blue Spirits, Sweet Chorus, others too numerous to list, and earlier this year is on world tour leading Soft Machine.